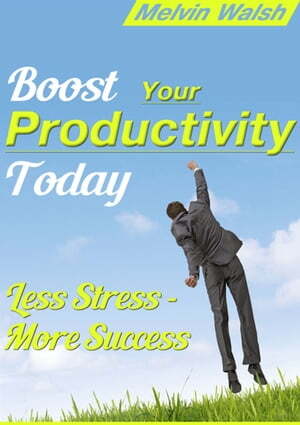 Collins Booksellers - Boost Your Productivity Today by Melvin Walsh, 9781310399695. Buy this book online. Are you having a good day? Hope so. Unlike you, some folks are not having such a good day. Take Ben, for instance. Ben is a good guy. A family man. Has a wife, the requisite number of kids and owns a house in the suburbs. He makes the commute to his office every morning and repeats the trip in reverse in the evening. Ben&apos;s trip home this evening has him literally shaking. Just before leaving work he was called into the boss&apos;s office. His boss is an okay guy too. But, he also has a "boss" to report to. It seems that Ben&apos;s productivity has come under question. While his boss was understanding and offered any help Ben needed, the unspoken message was clear. In old time vernacular it means "shape up or ship out." And, jobs as good as Ben&apos;s are hard to come by these days. Ben is visibly shaken. Thank goodness it&apos;s Friday and he&apos;ll have a weekend to figure out what to do. Right now he&apos;s wracking his brain trying to ferret out the problem. Yes, he knew he was not as productive as he used to be. He still worked hard but it seems like the harder he tries the further behind he falls. He&apos;s trying to rationalize why his numbers are down. He goes over a typical day in his mind. His office area has turned into a quagmire making it difficult to find anything. He tries to avoid "chatting" around the water cooler, but he didn&apos;t want to be rude. Didn&apos;t he just help out his friend and co-worker Jim with a project he needed help with? How could he turn him down? The more he thinks, the longer the list. Okay, that&apos;s enough about Ben. It&apos;s pretty obvious he has a serious problem and needs to get his act together asap or face the consequences. The sad thing is that most of us have a little bit of Ben in us. Whether at work, at home or anywhere in between we all could use a boost to productivity. Fortunately for you, there is a solution and you are just minutes away from it.